PerfectMembrane is the waterproofing membrane for use over any surface and bonds directly with most decorative coatings, epoxies and cements. Say goodbye to wire mesh, tar paper, EPDM and epoxy flood coats. PerfectMembrane does the same job at a fraction of the cost. It provides complete waterproofing, substrate reinforcement and crack isolation, all in one. Surface waterproofing: Waterproof any surface with PerfectMembrane. Turn your roof, bathroom, balcony etc. into the perfect waterproof deck. Reinforce surfaces: Reinforce weak or cracked surfaces with PerfectMembrane. You can use it over your existing coating system. Prime surfaces: Prime decorative surfaces including wood, concrete, tile and much more with PerfectMembrane. The primer can be used on surfaces that are indoors as well as outdoors. Isolate cracks: Reduce movement of substrate using PerfectMembrane and avoid cracks on your coatings by up to 90%. PerfectMembrane is a highly effective underlay system that is specified for use with decorative coatings. PerfectMembrane is flexible. It bends to accommodate substrate and coating movements unlike epoxies and rubber. You can use PerfectMembrane to bond your coatings and overlay to just about any surface including sealed concrete, VCT, paint, adhesives, epoxy, carpet, wood and ceramic tile. The membrane bonds to even the most difficult surfaces. PerfectMembrane achieves balance for substrate pH thus ensuring better adhesion for long term results. PerfectMembrane is safe to use and easy to install. No need for special equipment or experience. Simply apply the primer using a brush or roller. PerfectMembrane can be cleaned up easily with water before it sets. No need for special surface prep. No need for acid etching, neutralizing or water priming. The primer comes ready to apply and adheres to just about any surface. Are you dealing with a surface that has asbestos or lead? There’s no need for grinding. Encapsulate the surface for safety with PerfectMembrane. Save time and money by avoiding grinding and the need to dispose of grinding debris and soy gels. PerfectMembrane is VOC free, making it safe for use both indoors and outdoors. Save on material costs by eliminating the need for EPDM, sand flood coat, epoxy or tar paper. 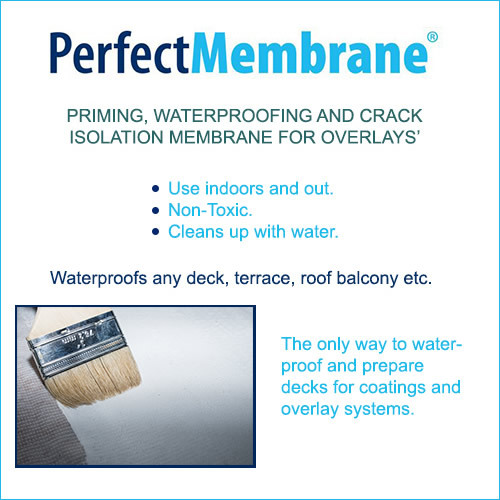 PerfectMembrane is the perfect choice for waterproofing and preparing surfaces for overlay systems and coatings.